This week over on Created By Hand the challenge is Spring Fever or Pastels. I used a bit of both. I only can wish this was happening in my neck of the woods. We've still got quite a bit of snow and chilly temps. It's a digital image by Floppy Latte Digital Designs, and this is one that I won recently. I really like the image. You can see the rest of the details and descriptions etc by clicking on the card image. Enjoy. I'm also using a Quietfire Design rubber stamp quote. Oh, WOW! Yogi - this is spectacular! Thanks so much! Love the colours, love the layout! This is stunning, Yogi! I like the swirly background! 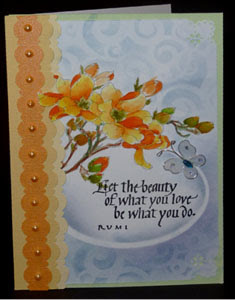 Your composition is beautiful and I love the idea of the soft stenciled background. Oh what fun and thanks for such wonderful instructions. What an interest use of color and design! You always have unique and beautiful ideas for the blogs - I appreciate your time, energy, and of course, artistry!